Gabo, Naum (1890-1977), Russian-American sculptor, one of the leading practitioners of 20th-century constructivism. Born in Briansk and originally named Naum Pevsner, he changed his name to avoid confusion with his brother, Antoine Pevsner, also an artist. He studied (1910-14) medicine and engineering in Munich, but in 1914 took up sculpture, producing cubist-inspired heads and busts using cutout sheets of metal, cardboard, or celluloid. In Moscow from 1917 to 1922, Gabo helped found the constructivist movement, which advocated the construction of sculpture from industrial materials rather than from traditional carving in stone or casting in bronze. 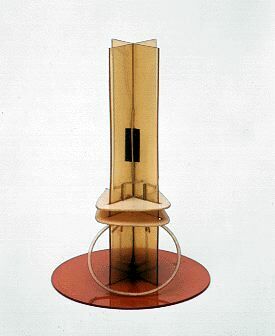 This piece of sculpture by Naum Gabo is a model for a larger piece he completed in 1923 called Column. The model, like the later piece, is made of glass, plastic, and metal. Column is a representative piece of constructivist sculpture. It is abstract, geometric, and created with industrial design methods. The model is part of the collection of the Tate Gallery, London. In 1920 he and his brother issued their Realist Manifesto, calling for new art forms based on space and time; in keeping with this theory, Gabo executed several works with moving parts, called kinetic sculpture. He lived in Germany from 1922 to 1932, where he executed works characterized by a monumental architectural quality, as in the glass, metal, and plastic Column (1923, Museum of Modern Art, New York City). During World War II, in London, Gabo continued to produce such characteristic works as Linear Construction, Variation (1943, Phillips Collection, Washington, D.C.), in which an oval space is outlined in clear plastic forms that, in turn, are delicately webbed with intersecting planes of nylon thread. In 1946 he settled in the U.S. One of Gabo's most notable works is a large-scale, 26-m (85-ft) tree-shaped monument (1957) commissioned for the rebuilt Bijenkorf (Beehive) Department Store in Rotterdam, the Netherlands, to commemorate those who perished in 1940 in the Nazi destruction of Rotterdam. His last major work (1976) was a fountain for St. Thomas's Hospital, London.